Our newly designed utensils line finds a perfect median between everything you should want in a utensil. 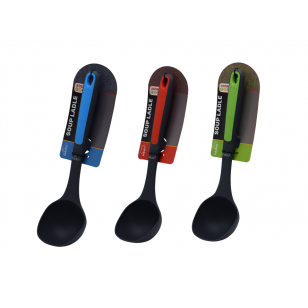 *Strong construction promotes the utensils versatility and durability. *Beautiful design which upgrades any kitchens style. *Practical structure with a well-designed built-in kickstand to keep your counter clean. *Our Iconic color-coded Dairy, Meat and Parve KOSHER COOK STYLE.